An extravagant castle on the cliff of the Saint Lawrence River with a stunning mountain backdrop awaits New Engla nd Golfers. The scenic route along the river, from Quebec City, north to Malbaie, leads to the Fairmont Le Manoir Richelieu Hotel. 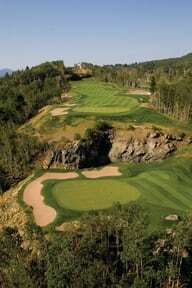 If you have an inclination to play, their “Club de Golf” has some serious inclines for fun traversing. It’s up and down on every fairway, but the scenery is steady with a water view from each of the 27 holes. Start with the signature number one on the St. Lawrence course for a steep downhill drive looking out to the open water. Better to miss left than right or the ball will be on the beluga run. Number two, a short downhill beauty amazes, then the par 5 number three takes your breath away as well as your balls if you aren’t careful. Four continues the descent and five climbs back up, six down, a zigzag design to incorporate the water views. If you only play nine holes, this is the nine, but they all deliver fun golf and the splendor of the seaway. Putts slide to the water but sometimes water is on two sides. If luck eludes you on the greens, try the casino. President Taft’s red phone spent summers in Charlevoix where you can hike the mountain or venture out on the water. It was the first fjord we ever forged by sea, but not our first whale rodeo. Who could tire of the majestic breaches and sonic blows of the kings of the sea? Finbacks and minkies, not at all dinky played hide and seek with the tour boats, gracefully emerging for air. The year round Beluga was spotted by one and doubted by some. Converging currents in the St. Lawrence Seaway, from the great lakes, the Atlantic Ocean and Lake St. John trap the tiny creel, on which five types of whales come to feed in a summer and fall frenzy. Le Manoir Richelieu is literally an astronomical and gastronomical experience. Astrophysicists and occasional star gazers alike are beckoned to explore the galaxies from the observatory on the deck of the Restaurant Terrasse. Inside or out on the tiered terraces, watch the massive ships navigating the river, and be lulled by the tranquil water, the clanging of the red buoy, and the lilt of French. Chef Patrice serves up the local flavors. It is a sweet place with maple as a key ingredient. For more food fantasy, graze along the Flavour Trail in a chauff eured motor coach. Start with a French bakery unsurpassed in pastries and accompaniments. Proceed to the duck farm where not so lucky ducks (but tasty) are raised the Basques way. Three months pass and they become fois du gras. At the cheese maker stop, Maison d’Affinage, you won’t get milked by the price of the cheeses, but you can observe as the sheep get milked in the parlor. Herded in and out by a little dog, they settle into their miniature milking stanchions for their two minute unloading. This sounds silly, but is amusing to watch. Enough with the foods, it’s time for beer. Hop along to the Microbrasserie Charlevoix, where hops are brewed and distributed in the U.S., except for their La Vache Folle – (Mad Cow). The FDA didn’t like the crazy cow’s eyes, thinking they might encourage people to drink more -really? A new beer with champagne yeast appeals to the connoisseur, someone who likes to savor a couple nice brews. Beer crafters drink it; beer bigots won’t, according to owner Frederick, who learned his English by watching Sienfeld episodes. Artisans of food and drink are joined by local painters, collaborating on packaging and promotions as the region is heralding the “slow food movement “. The idea is to take your time and savor the flavors while enjoying the company. Many art galleries are open for viewing in homes along the town and country roads. There is no better place to complete the trail than back at the Fairmont which is in and of itself an art gallery. Built in 1899, more than $140m was invested in 1998 for renovations to make the property a premier vacation spot in any season. The entire region feels like a different country. Oh, that’s right, it is. Fluency in French is not required when you journey to the wonderland of Charlevoix, Quebec, Canada, but you may pick up some Francais while there, like Que Magnifique! Merci Beaucoup!